The market for Beatles memorabilia is thriving - but beware of fakes, dealers and collectors have warned. 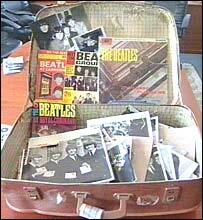 This week a suitcase believed to be a holy grail of "lost" Beatles treasures turned out to contain little more than shoddy photocopies of ticket stubs and concert programmes. The collection, bought for less than £20 at an Australian flea market, had wrongly been thought to contain priceless recordings linked to former Beatles roadie Mal Evans. The much-heralded find was later dismissed as "farcical" by Beatles expert Peter Nash of the band's British fan club. At the same time, the price for bona fide Beatles collectables continues to go through the roof at auction - nearly 35 years after the band's demise. Full sets of band autographs that could be snapped up for £45 shortly before John Lennon's death in 1980 now command up to £45,000 - a 1,000-fold increase. "As an investment it's far outstripping the stock market," said Beatles expert Richard Porter, who organises Beatles walks in London. However, dabbling in Fab Four autographs and memorabilia can be perilous for the novice or the uninitiated collector. The marketplace is awash with counterfeits and "secretarial" signatures completed by members of The Beatles' entourage. These were completed for fan club members or written "blind" backstage during early live shows. Ironically, even these copies can now fetch a tidy sum in their own right because of their authentic association with the Beatle legend. Beatles expert Richard Porter said: "You have to have a really trained eye to spot forgeries. Mal Evans and [former assistant] Neil Aspinall often signed for them, and they're quite hard to spot. "With internet auction sites it's become very easy to buy and sell, so there are many of these forgeries around." For the seasoned fan, some fakes are less difficult to see through than others. One tried to pass off a "signed" Lennon album which was not released until 1984 - four years after his murder. Yet genuine Beatles rarities continue to surface. EMI reputedly paid about £70,000 for an audio tape of the pre-Beatles band the Quarrymen, which marked Lennon and McCartney's first meeting. While film footage of the group in Hamburg-era black leather also made it to the auctioneers. McCartney's brother Mike has an early recording of the band live at Liverpool's Cavern club - though this is thought unlikely to emerge from the family vaults. And despite the seemingly exhaustive nature of six sides of Anthology material, the appetite for bootlegged Beatles songs grows all the time. Within this canon, the legendary Mal Evans archive is highly prized. As their roadie, Evans' duties included cleaning up after the band, gathering discarded lyrics which now sell for more than the cost of a house. "There is a whole lot out there," said Mr Porter. "But as George Harrison said, if they released it, it would be scraping the bottom of a barrel."